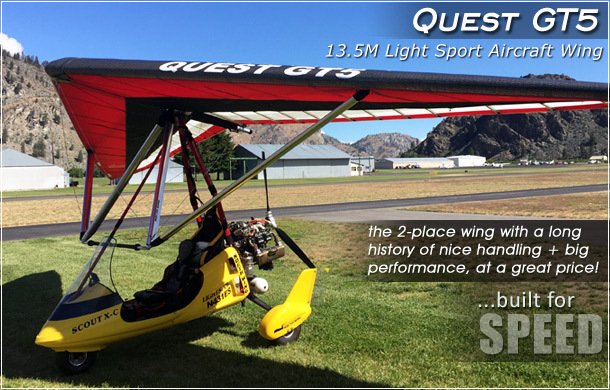 The Quest GT wing has been improved again! 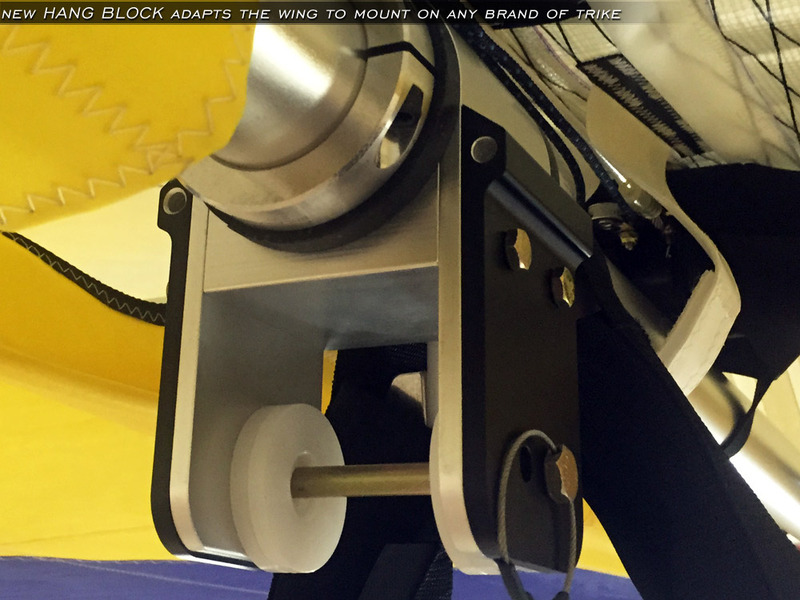 Stronger leading edges, stronger cross-spar, increased load rating to 1060 lbs! 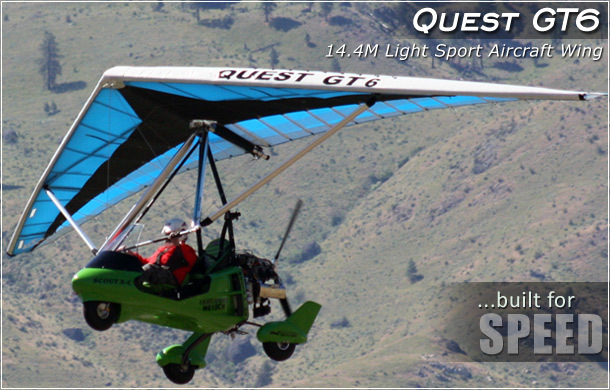 The beautiful strutted Quest GT5 and GT6 is designed for two place light sport aircraft with a gross load rating of 1060 lbs. 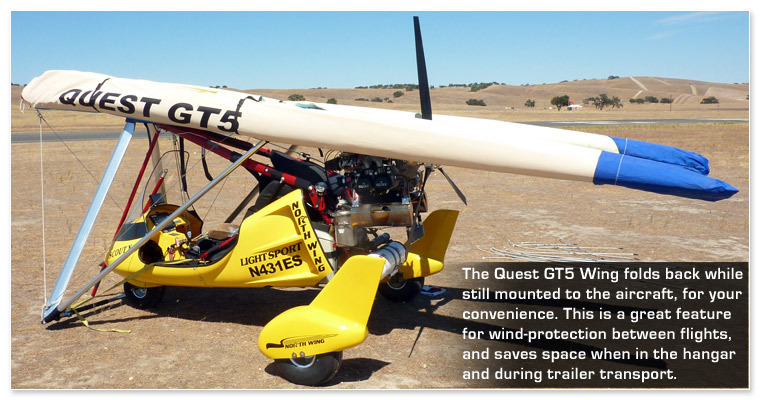 The Quest GT5 is designed for our Scout XC Apache, Scout XC Navajo, Sport X2 Apache, and Sport X2 Navajo light sport aircraft. 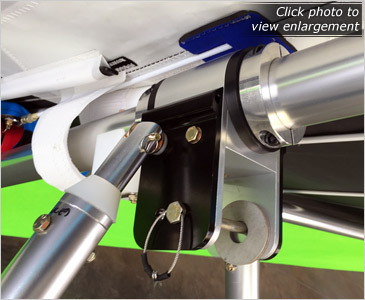 You can also attach the Quest GT5 wing to your light sport aircraft using our Universal Mount. When you want to get somewhere fast, this is your wing! 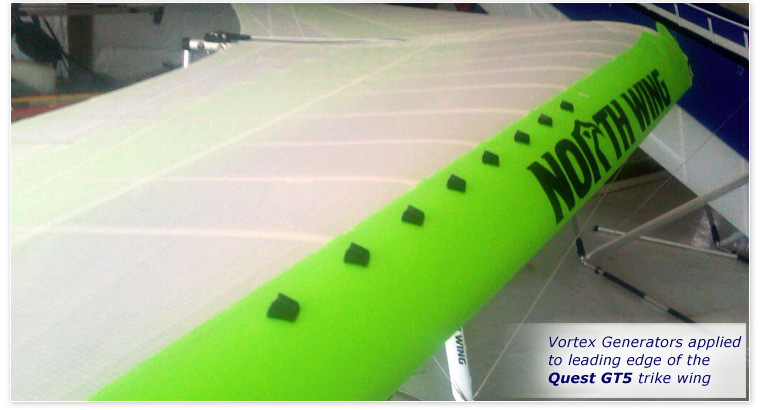 The Quest GT5 and GT4 wings can be improved even more with the optional Vortex Generators Kit. 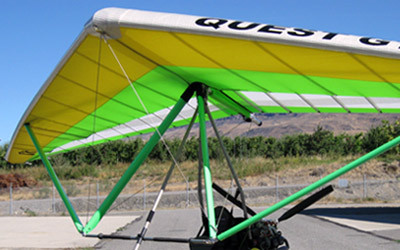 As a descendent of the Contour wing, the Quest's ability to fly cross-country and handle turbulence well has been improved. 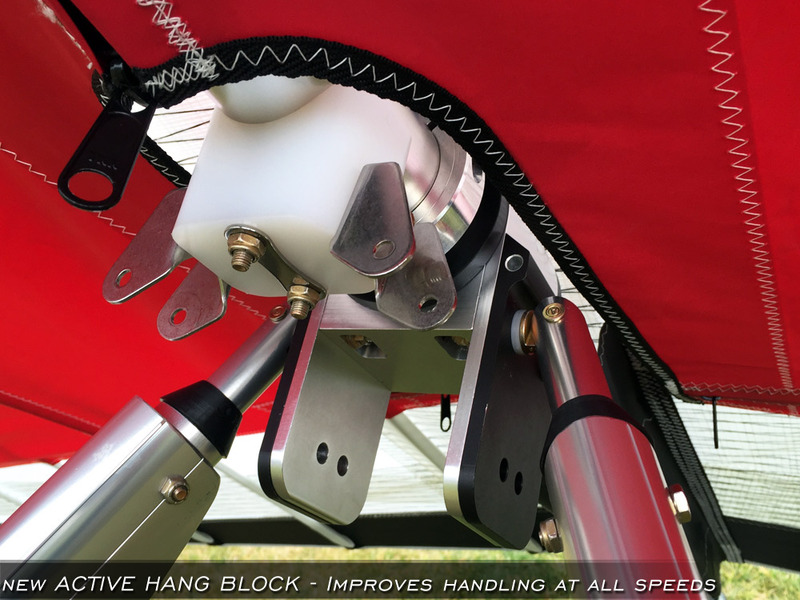 All this is possible because of eighteen months of design research, resulting in an unmatched speed and handling combination! It is very important to us to offer you the best wing we can make. 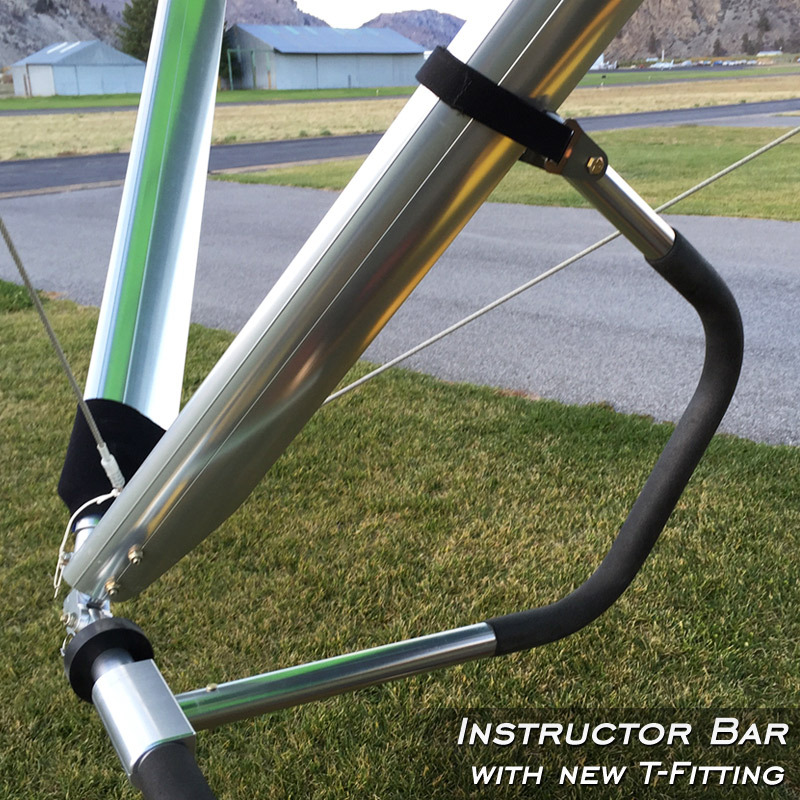 We could use tubing that costs less, but we choose to have our own tubing produced for specific main spars. 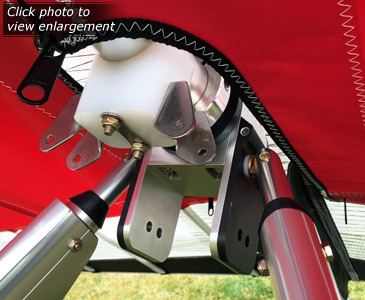 We also could buy cheaper sail cloth; again, we choose to purchase the best. 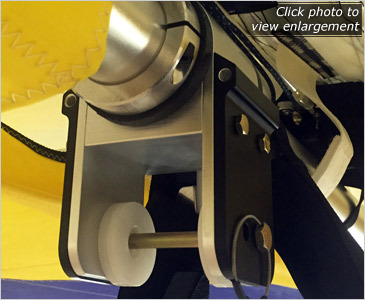 We use all aircraft hardware and materials tested to required aircraft strength. 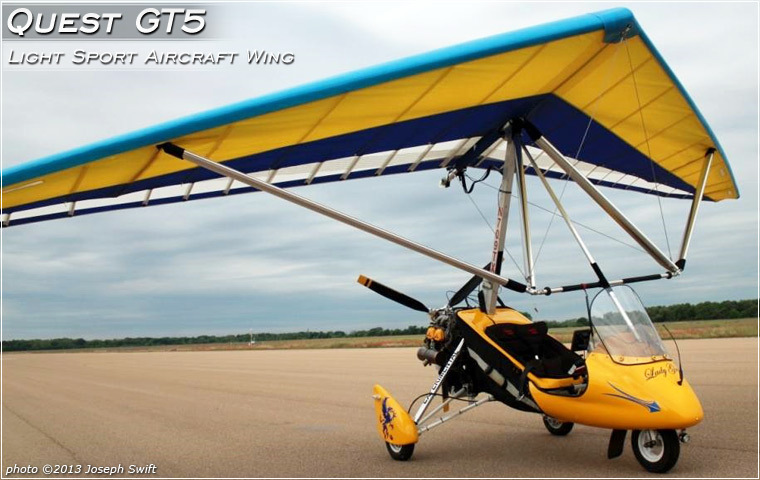 The Quest GT5 is a highly refined, strutted wing capable of a 45 mph range of speed from stall to top speed. One of the most impressive achievements in the Quest GT5 is the light handling both in pitch and roll. • Quality and Service you can fly on! 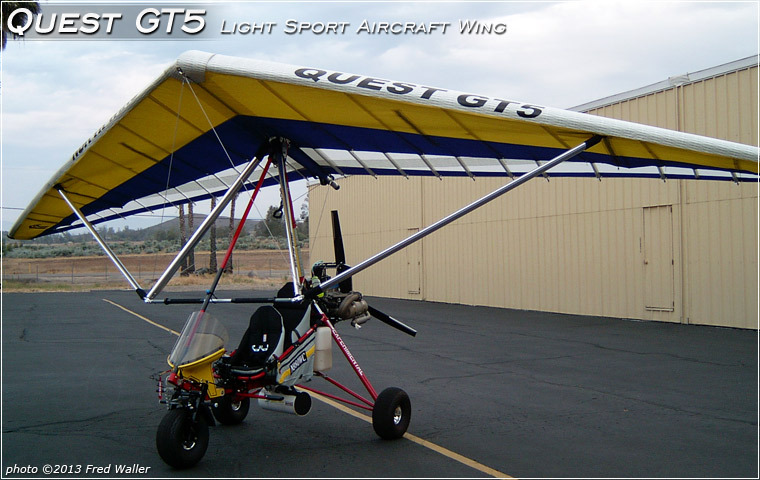 Fly the Quest GT5 Wing on any brand of trike! 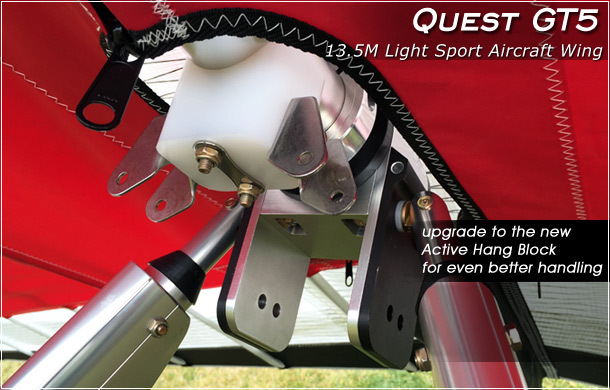 The new Pivot/Hang Block adapts the Quest GT5 Wing to attach to your Airborne, AirCréation, or any other brand of trike. 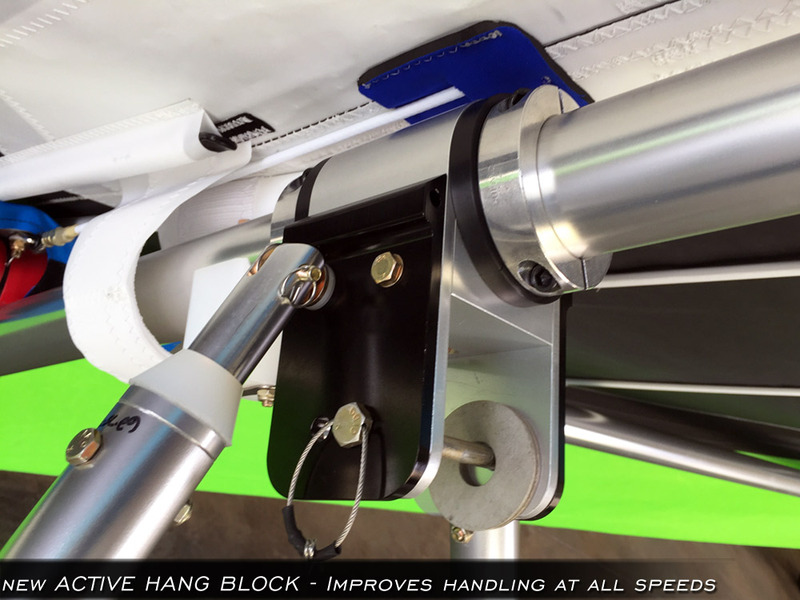 Upgrade to the new Active Hang Block for even better handling! control-input from the pilot, and also gives lighter handling pressures while initiating turns. Customize your new wing with a custom color applied with our Powder Coat paint process. 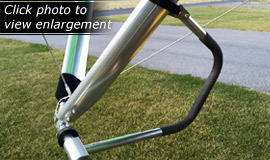 Your wing will look great and also benefit from the powder-coat's corrosion barrier seal. 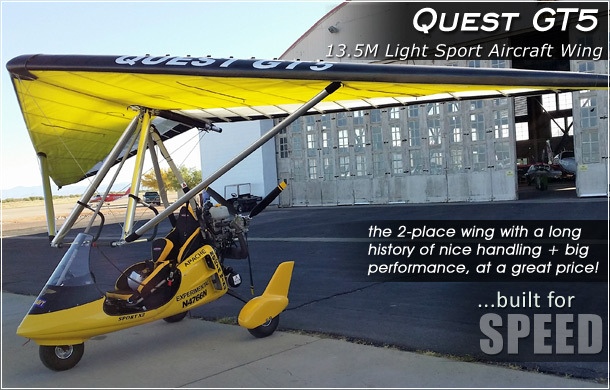 North Wing now offers a new performance enhancement option for the Quest GT5 and Quest GT4 Trike Wings. The new Vortex Generators Kit improves wing handling and performance by controlling airflow over the upper surface of the wing. The vortex generators create vortices that energize the boundary layer, providing improved wing control authority at low speeds and high angles of attack. 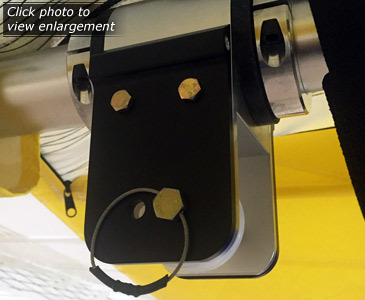 This kit is a low-cost investment to improve safety and performance. 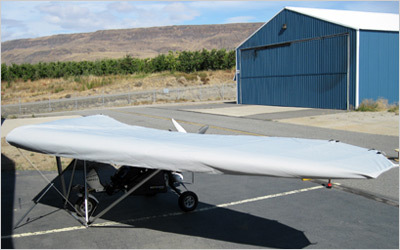 "Hi Kamron, I just wanted to take a moment and let you know that I got the chance to fly my brand new 13.5 meter North Wing Quest GT5 wing for the first time yesterday and was thoroughly and completely impressed with its beautiful handling and performance. 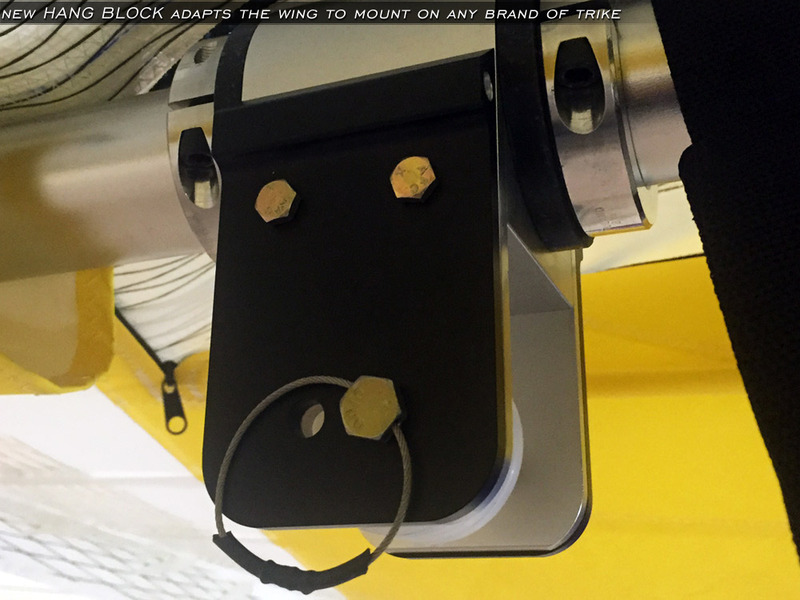 And when I also consider the the overall build quality of this new wing, from the beautifully designed and flawlessly made wing hardware, to the high quality crafting & sewing of the sail, it comes to mind that you have produced a truly world-class wing that you and your company should be proud of. 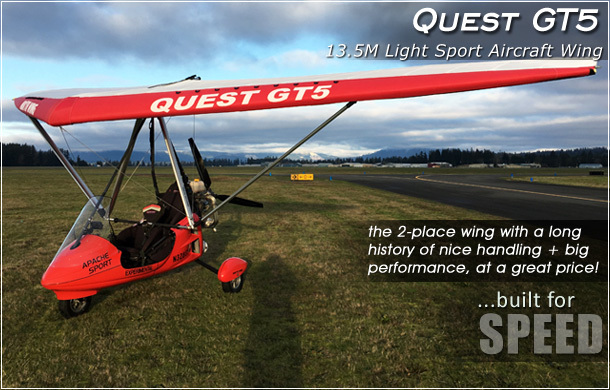 Thanks so very much for your efforts with the Quest GT5 and congratulations!" - Sincerely Yours, Joe Swift Thanks to Joe Swift for sending us this picture of his aircraft! "Hello Kamron, Got the "Vortex" kit on. This wing is without any doubt the best wing I have ever flown. I have a friend with an Airborne 912 sporting a Streak wing that is also 13.5 meter. We went out flying late Thursday afternoon and he was calling me every few minutes about the turbulence, I felt a few gentle one's with an occasional bounce. Thanks for the great wing. Fred Thanks to Fred Waller for sending us this picture of his aircraft!